How I organize my life | Save. Spend. Splurge. Now that I have had a smartphone (iPhone), and sold it to go back to my old iPod Touch ways, I figured a little post on how I keep myself organized may be useful to others, and for me too! I like hearing suggestions on improving my life. As a quick background I am pretty much a lazy organizer. Sounds oxymoronic but it’s true. I don’t like very complex systems with dependencies of tasks to track, and if it’s too complicated for me, I tend to stick to it for a week and then give up because I can’t live like that. BF is the total opposite. The more complicated and complex it is, the happier he is. He really likes his life strictly organized down to the most minute of tasks. His brain functions in a rigid 90 degree angles, arranged an inch apart, all in little white, neatly labelled boxes. My brain doesn’t function in straight lines. I am more carefree with a flexible structure. This system is for you, if you don’t like missing appointments or deadlines, but you don’t want to have to dig down into 3 levels or more of folders just to make a note to yourself about something. Things you have to do on a regular basis, or notes to yourself for future dates so you don’t forget them. Anything I need to get done, I make a note of, and I set it to repeat in any way I choose (AwesomeNotes has a real flexibility in terms of that). I organize my life in separate areas that make sense to me within the two screens I flip to the most in my daily life. Otherwise, the other folders are just for recording purposes like when the last time I went to the dentist was. To Do (Work): Work-related only. Right now it’s only listing out the holidays. Tasks: This is for blog-related (recurring) things. I don’t want to write “BLOG-RELATED”. Appointments: Anywhere I have to be, I log the day, time, location, and directions on how to get there. Think: Anything I don’t want to keep in my Do it Tomorrow notepad, but don’t want to delete forever. Books: Books I want to read. Bank/Logins: I can never remember all my logins. For passwords, I put a cryptic code that will trigger the actual password in my head. I NEVER store ANY passwords here. Work Account: Anything related to work, but not daily tasks. This includes notes on clients/people. Travel Points: Enough said. I store all those darn numbers here. I just take a receipt for anything I buy. If I can’t get a receipt, I head over to Do it Tomorrow and make a quick note to myself. Before the end of the day is up, I log the amounts I spent from Do it Tomorrow and cross them off the list. If I just want to write it down but deal with it later, I use Do it Tomorrow. If I don’t have the iPod Touch on me, I grab any old scrap of paper and write down things on it until I can get it entered into my iPod Touch. At the end of the day, I sift through all the notes, then cross them off, or properly log them into their respective folders with deadlines and organization. It mostly serves to help me filter everything I think about before committing to it by entering it into AwesomeNotes as something long-term to do/think about. For longer notes, I use the Apple app Notes. It’s when you need a longer page than just 3 lines to record an idea in detail, but you don’t necessarily know where or want to keep it in AwesomeNotes. 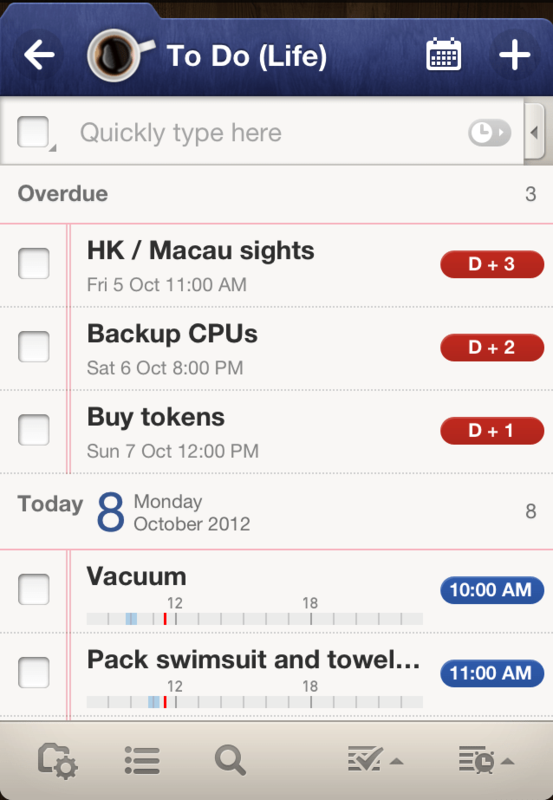 For anything that requires a bit more organization and complexity, I turn to the To Do app. At the moment, I only use it to list out my Packing Lists of what I need to pack and carry when I travel for 2 weeks, a month or 3 months and longer. 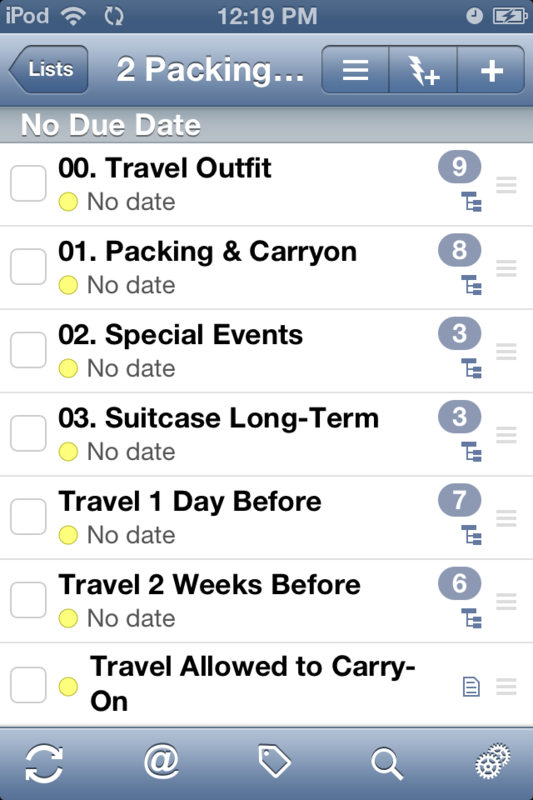 I have categories for each travel category, and then within each, tasks and categories for each bag and compartment. I don’t use AwesomeNotes for this because it’s too simple and annoying to organize without multi-level folders within folders. I don’t actually check anything off or remove things from the list once I’ve packed them, I use it as a way to review and make sure I’ve packed everything I said I would pack. I also make notes about hotel and flight confirmations on here, which is the old school way to using TripIt (which I prefer, but requires a wifi connection). If I had to manage a personal project, I’d use this To Do app. Otherwise, for work projects, I always use MS Project or Excel. That’s a quick overview of how I organize my life. ← Who needs a college education anyway? Just wondering if you still use these methods? Interesting. I think that if I had to plan to pack, that would be a little too Type A for me, but if it works for you, that’s great. I’m way more old school and keep lists on paper, but they’re just general to-do lists or lists of books to read or notes on life. Can’t say I’ve ever written “pack swimsuit and towel” on any list though. With how much I travel, those lists have saved me from forgetting an adapter when going overseas or all the little things you wish you remembered!!! I also use them to review that I’ve packed everything before I left the hotel, saving me on forgetting something. I love this! I’m going to check out the “Do it tomorrow” app. I’m fairly old school and have been carrying around a planner all these years, but I figure it’s time to put the iphone to good use. I find it easier to erase/delete things than with a pen and paper. Plus I have very messy writing. After attempting to organize my life with a day planner in the paper days, a palm pilot in the early 2000’s, and a blackberry/iPod touch in the later 2000’s, I’ve simplified things and found the best thing that works for me is a single large wall calendar and a bunch of sticky notes. All major important events go on the wall calendar where I can see a full month in one glance. All minor things go on a sticky pad. 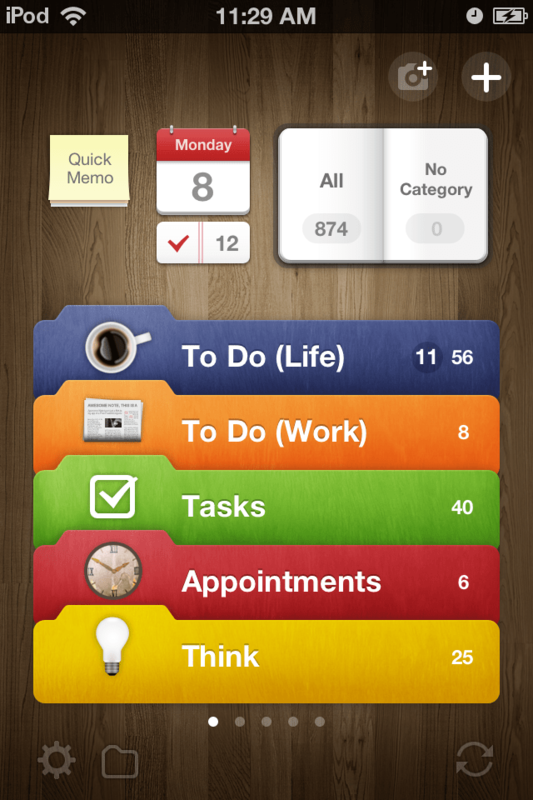 As technologically inclined as I am, I still haven’t found an electronic organizing system I really vibe with. I also write too much. I have lists for everything and doing it by hand is annoying because I make mistakes and feel like I should rewrite it. Great ideas! Mom are always trying to find ways to get organized. Especially with my three children’s schedules – doctor appointment, soccer practices, and the list goes on. What I thought would work well for moms is a big calendar in the kitchen!! But it is hard to sync online as well, hence why they might need an electronic version. TO DO LIST – Everything I need to remember/do goes here. EVENTS – Holidays, Birthdays, Anniversaries, etc. FOODIE PLACES – This is new. I just started it. Making a list of places I want to eat with a map and pictures! Once a Google Map app is out I’ll move this there. 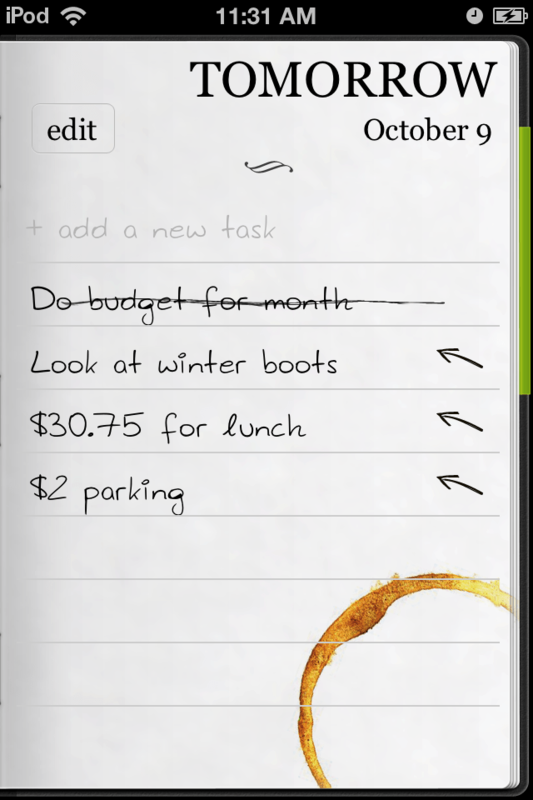 SHOPPING LISTS – Includes clothes, make-up, and grocery lists. MY JOURNAL – Sometimes when I want to write something personal. Password protected. GIFT IDEAS – Ideas about presents for friends. 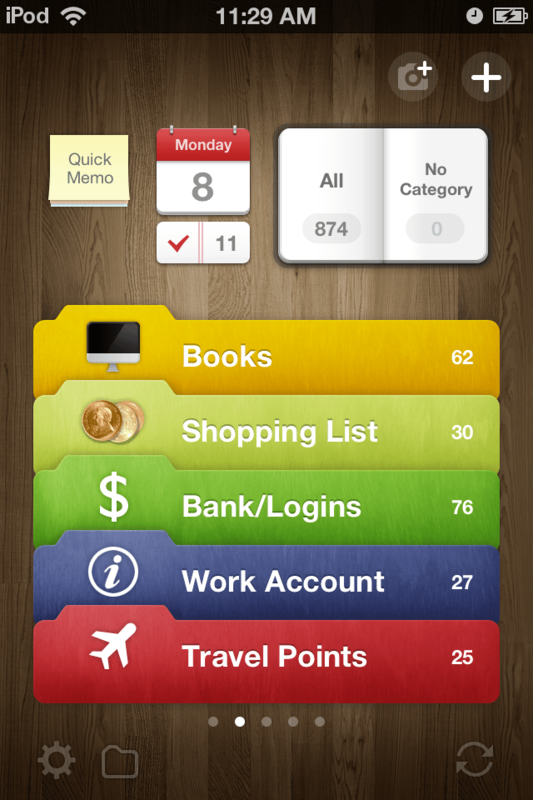 I use the quick memo for things I want to remember but don’t belong anywhere else. It is quite hard for people to crack my code to be honest. It has nothing to do with what the real password is, and 4 vague letters for instance, trigger a 18 character password in my head. I just got a smartphone and am trying to figure out which apps and how to organize my life on it. I think I’ll try your apps first! can’t beat Mochi-recommended!